A fantastic article about us in the Ashford Herald this week. 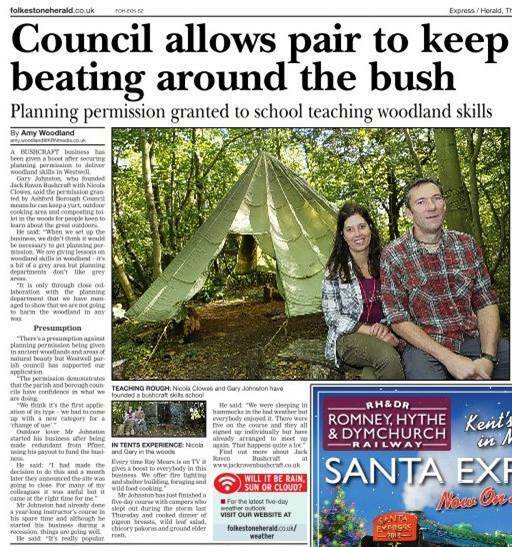 We initially spoke to the newspaper about us gaining planning permission to operate in our stunning ancient woodland camp. We’ve posted about that previously here. The article then goes on to talk about how we came to set up the business. It goes on to talk a little about the activities and courses that we run. We were blown away by the fact that the journalist we spoke to, and subsequently wrote the article, is called Amy Woodland – must be a good omen! Plenty of photos showing what we do on our Facebook page.